Hey folks! Here is the second half of BB Couture's A Touch of Greece collection. The colors are named after the deities of Greek mythology, which happens to be one of my favorite subjects! Hemera is the Goddess of the daytime and like Apollo, her color is vivid and bright. She is a deep carrot orange packed full of light silver shimmer. I thought this might be close to Catalina Cutie, but they're pretty different. This is two coats. Actually a Titan, Selene is the Goddess of the moon. I prefer the Olympian Roman derivative of Artemis, Goddess Diana personally, but I like the name Selene--too although I'm not sure how to pronounce it. This loud fuchsia has a pinky-purple flash with lots of green and gold glitter *edit: and holographic glitter! Two coats. Cybele is the Goddess of nature and fertility, also known as an overseer of caves and mountains. This polish really stood out to me among the other colors. She looks like a swirling vortex in a bottle! I would describe her almost frosty sheerish base color as muddy rose clay with a green sheen. It is also chock full of green glitter. This builds up nicely with three coats. I could see using it as a topcoat as well. Gaia is the Earth mother Goddess, so 'natch, she's green baby! This mama is a shiny glisteny light kiwi green with a slight shimmer/frost. Pretty unique in my collection. This is two coats. Perhaps the most well known Greek Goddess is Aphrodite. Of course there had to be room for her in this collection! 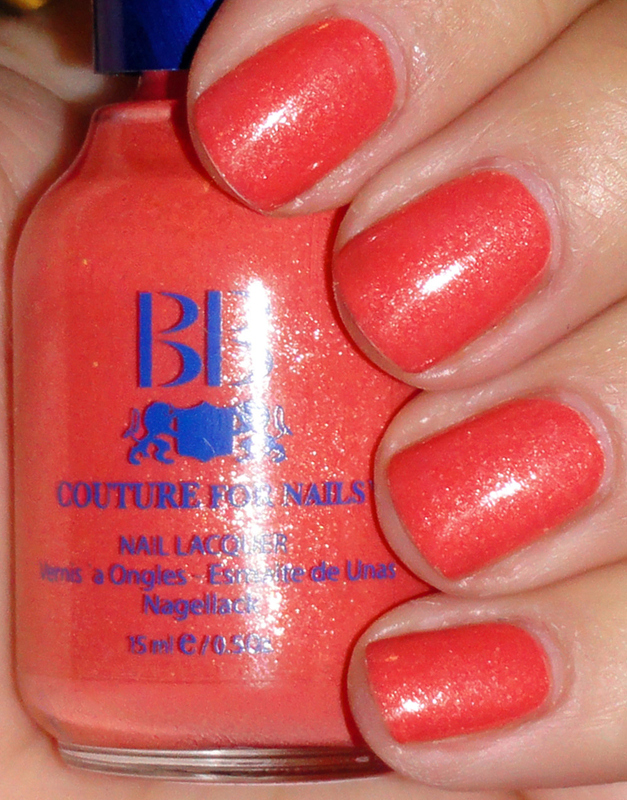 She is the Goddess of love and beauty and the polish embodies that through the color of pink! There are also candy floss shimmer strips of silver weaving through the icy pink polish making it very girly. It's actually a bit lighter than this, but the flash makes it a little darker. This is two coats. Last we have Nike, the Goddess of victory. Not just a brand of sports gear ;) This polish is a medium, red based purple with lots of silver, blue, and red shimmer. This is two coats. Whew, what a collection eh? I am very happy with the formula on all of the polishes, for both the men's and women's colors. You will be able to purchase all of these from BB Couture's website for $9.95 each. P.S. I will be taking daylight swatches of this entire collection as soon as possible to show the colors more true to life. My flash photos are just not up to my standards lately, and I apologize for that. However, I did want to get these posted quickly to highlight the collection for Cindy over at BB Couture. Cheers!